MANILA, Philippines - The International Transport Workers Federation (ITF) has accorded an honor of international category to the late Capt. S. Oca (MM, Ph.D.), founder of the Associated Marine Officers’ and Seamen’s Union of the Philippines (AMOSUP), in recognition for his strong commitment and sterling achievements in championing the rights of ocean-going Filipino seafarers, and his vital contributions in the global maritime industry and healthy growth of employment of the country’s seafarers by foreign shipowners. ITF Maritime Coordinator Steve Cotton, personally presented and pinned the “ITF Badge of Honor” on Mrs. Mercedes Fernandez-Oca, wife of Capt. 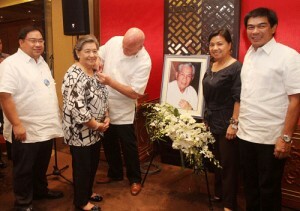 Oca, in behalf of the late master mariner, in ceremonies held at the Mabuhay Palace of the historic landmark Manila Hotel on May 24, 2011, in the presence of other officials of AMOSUP and Maritime Academy of Asia and the Pacific (MAAP). Capt. Oca, a byword in the seafarers’ world, founded AMOSUP more than 50 years ago. The union has grown to become the world’s largest with close 90,000 members now. A man of vision, Capt. Oca had a long dream for Filipino marine officers and crew members to be “at par” or more “competitive” with the seafarers from other countries, including those from Europe, Western hemisphere and other parts of Asia. He conceptualized and put to action the establishment of a maritime institution which he long visualized to help uplift the lot of Filipino seafarers to enhance professionalism and to be “globally competitive.” In collaboration and cooperation with his colleagues here and abroad, MAAP was established in 1998 in Kamaya Point, Barangay Alas-sin, Mariveles, Bataan. He named Vice Admiral Eduardo Ma. R. Santos, who has, just then, retired as flag-officer-command (FOIC) of the Philippine Navy. Admiral Santos, one of the best and outstanding chiefs, the Navy has produced also served the government as vice chief of staff of the Armed Forces of the Philippines (AFP). Capt. Oca was also the chairman of the board of governors of MAAP, now a leading maritime institution in the whole of Asia-Pacific, and equally competitive in the world. It has “state-of-the-art” facilities in its campuses located in huge hectare of land fronting the sea breeze-rich shore and coastline of Bataan. ITF President Paddy Crumlin earlier visited MAAP conferred with AMOSUP and MAAP officials, where they discussed plans and projects aimed at improving working conditions, improvement and professionalization of Filipino seafarers deployed aboard foreign ships.